Ginisang munggo, sautéed mung beans (munggo is also calle green beans for some) is a savory dish that I consider as one of my comfort foods. 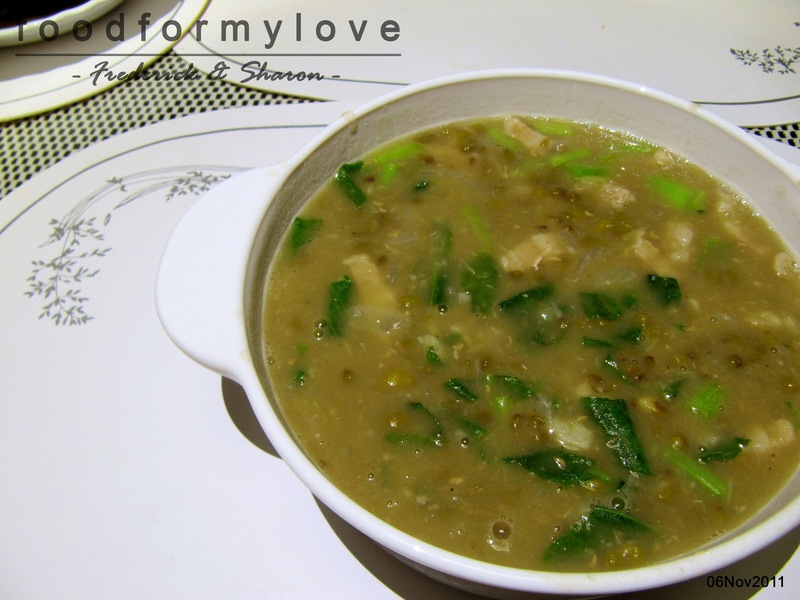 Mung beans are popular not only among Filipinos but also among Asians. InSingapore andIndonesia, mung beans are often used as ingredients in many desserts (mung beans) and main dishes (as mung bean sprouts). For most Filipinos, like us, the sight of mung beans would automatically make us crave for ginisang mungo (sautéed mung beans). It’s sweet taste complimented by the flavors of other ingredients that we add, like bagoong, or pork, or chicharon, or tinapa, or vegetables, etc. makes it deliciously savory. It is generally considered as a healthy food, that is, if you don’t add “unhealthy ingredients”. It is an abundant and cheap source of quality protein, that comes with a lower calorie and zero cholesterol (not to mention that it is also a good source of dietary fiber, carbohydrates, and other vitamins and minerals). But of course, there’s always that other side of the mung beans. This may be considered as super food for some due to its health benefits (help lower blood cholesterol, etc.) but for those who are suffering from gout, arthritis, or have problems with uric acid, like my sister Kristine, it would mean, pain and agony. Pork Belly – 250 g.
Sea salt – 1 tsp. ** Any leafy vegetables or any vegetables of your choice: ampalaya leaves, ampalaya fruit, malunggay, eggplant, pechay, I also put cabbage sometimes, Siling haba, alukon (I don’t know how it’s called in English), etc. etc. 1. Cook the mung beans in a pressure cooker for 20 minutes (start timing it from the moment the pressure cooker whistles. 2. in another pan, sauté the garlic, then the onion. When the onion is translucent, add the pork and pan simmer it until the pork is cook. 3. Add the cooked mung beans. 4. Season with salt, ground pepper, and fish sauce. Let it boil for a few minutes. I boiled it until the sauce is thick enough for me. 5. Add the kailan leaves and stalks, (or any other vegetable of your choice) boil until the veggies are cooked then remove from the fire. Makes 4 servings . Here’s the estimated Nutritional values per serving based on the ingredients used. This computation does not include the addition of leafy vegetables like the kailan. Calories : 116 kcal Total Fat: 2.5 g.
Cholesterol : 46 mg. Saturated fat : 0.84 g.
Protein : 22 g Dietary fiber : 4.25 g.
Sodium : 1,796 mg. Carbohydrate : 16 g.